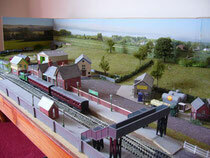 View during building of the Elham Valley Model Railway Club's last project to build a model based on Elham station. The first phase is complete and the model was taken to the club's show in November 2016. 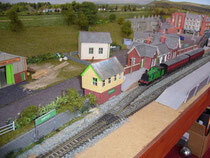 EVMRC N gauge model railway layout 'Shepley' built by Bev Sheppard. Passenger train pulling away from station onto single line. A mixed OO9 and OO gauge layout all to 4mm scale of a hypothetical quarry and works in the upper Elham Valley with a rail connection to the Elham Valley line. There was a works at South Canterbury but this is not a model of that site. The model shown here is in an early stage of construction. See the Activity Page for further photos. The Elham Valley Model Railway club's 'Toy Train' Layout has been built for adults and children to run their own stock at exhibitions. It consists of a double track circle with a reversing loop across the centre. It is built to '00' standards from readily available components. Dulwich Vale is a fictional town in southern England. 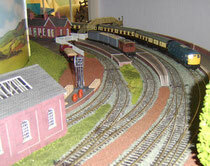 This model railway track plan is inspired by Mayfield, an ancient village on the now defunct Cuckoo Line. 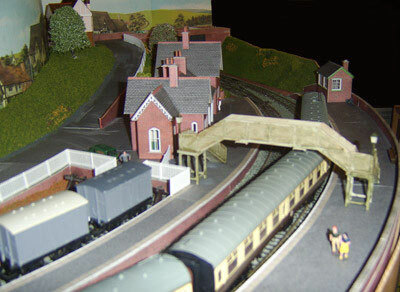 It is a circular model railway layout, 6 feet 10 inches diameter, built in OO gauge as an experiment to see how small a reasonable design could go. 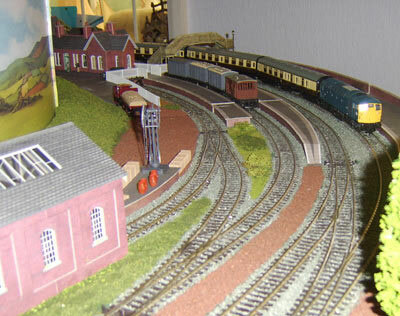 4mm DCC controlled circular model railway layout by Nic Rushton. Approach to Dulwich Vale Station during construction. St Peters Road was built and was operated by the then O Gauge Group. 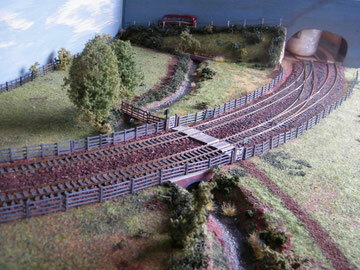 It is a 7mm model tram layout 16’ long with two diverging routes. It operates using live overhead. 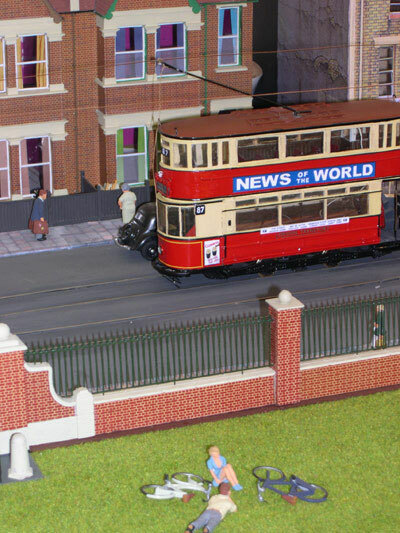 The trams operated were a mixture of scratch and kit built cars and model conversions. They were mostly first generation UK vehicles but tramcars from other countries seem to creep in. 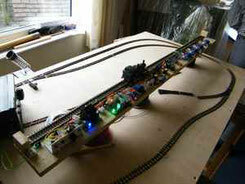 The layout is currently withdrawn whilst it undergoes a radical rebuild and re-wire.